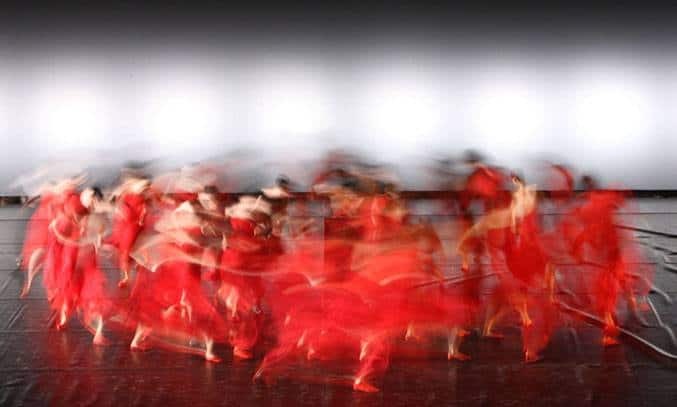 Following a sell-out performance at the Edinburgh Festival in 2011, The National Ballet of China bring their captivating production of THE PEONY PAVILION to Salford’s The Lowry. Adapted from Tang Xianzu’s play of the same name, THE PEONY PAVILION tells the tale of heroine Du Liniang who, whilst dreaming, falls in love with a young scholar called Liu Mengmei. Believing she will never meet her lover in waking life, Liniang is quickly consumed by lovesickness and sinks into a decline and dies. Meanwhile Mengmei has set off in search of the girl of his dreams. Despite arriving three years after her death, the power of their love defies even death and the lovers are finally united. Complex, beautiful and utterly enchanting, National Ballet of China’s production of THE PEONY PAVILION is a sumptuous feast for the eyes and ears. Director Li Liuyi and choreographer Fei Bo have redrawn the 16th century epic (which was first performed as an opera and lasted a whopping twenty hours) into a enchanting and visually striking two-act fusion ballet that’s powerful, complex and full of emotion. The two act, six scene piece sees a company of over 70 dancers perform to an eclectic post-modern score to the music of Debussy, Ravel, Holst and Prokofiev. Fei Bo’s choreography combines Western classical ballet with conventional Far East influences, and for the most part, serves the story well. The first act – which is played out to Debussy’s Afternoon of a Faun – sees three dancers play the role of Liniang: Zhu Yan as Du Liniang, the ballerina, and Lu Na and Jia Pengfei as her two alter egos, the Flower Goddess Liniang (representing the physical self dressed in red) and the Kunqu Liniang (representing the spiritual self dressed in blue). While Zhu Yan is clearly the lead, it is actually Jia Pengfei who steals the show, her elaborate costume and hypnotic vocal commanding the stage much more than the rest of the cast. Act two sees a change in both the score and the movement. Here, moments of forceful modernism, particularly in the depictions of hell, start to creep into the choreography and the piece begins to engage more in the senses than it does the emotions. Yet while there are some lovely elements in the piece, the production isn’t without its flaws. The costumes by Oscar-winning designer Emi Wada are magnificent to look at but the long sleeves tends to obscure the otherwise beautiful arm and upper body movements at times . As beautiful as THE PEONY PAVILION is, it is also a complex piece that can be a little difficult to follow. Even with the programme notes, it’s easy to get lost as the piece journeys from dreams to reality, moving from the mythic realms of Heaven and Hell. That said, Li Liuyi’s intention isn’t a straight retelling of Xianzu’s story and instead chooses to focus on the emotion of the piece. 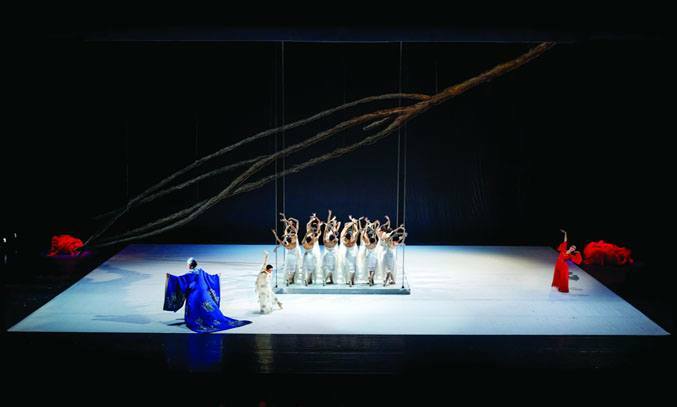 The ballet’s startling and ritualistic finale in which Liniang is finally delivered into the arms of her lover, is also visually stunning, as the mortal and spirit worlds join together in a wild, wheeling circle dance. With its lustrous costumes, striking sets, stunning musical score and exquisite dancing, it is easy to see why THE PEONY PAVILION has fast become a gem in The National Ballet of China’s repertoire, as well as one the most enduring love stories in Chinese literature. The National Ballet of China: THE PEONY PAVILION runs at The Lowry until 26 November.